"Lefty fundamentalist" yielded no results on Google. It doesn't seem to be in use on the internet. I hereby claim it as a new word, more properly a new phrase. I'm interested because there seems to be a need for a new word (which is what a neologism is) to describe the group of people who constantly make the hysterical claim that George W. Bush is dumb. I've heared that often enough, in San Francisco, to know its a religious statement. There is a wonderful book Predicting New Words by Allan A. Metcalf that helps understand neologisms. There are over a thousand new words each year that enter the English language; a few survive several years and a very few survive decades. The most successful new words are ones that start out with an air of humor or ridicule, like dot.com, google and cyberspace. I hope lefty fundamentalist is appreciated as humorous. Several friends asked me, "Who or what is a lefty fundamentalist?" I'll use a definition I wrote-up for a conference I'm planning on a related issue: a lefty fundamentalist has "been comfortable supporting labor movements, being hostile to big corporations, and corporate internationalism; he/she has supported socialism, socialist countries and been sympathetic to communist revolutions; he/she has consistently shown a distaste for war and capital punishment and often supports national independence movements." I could throw in a few more extreme activities like supporting Abu Mumia Jamal (the modern day Rosenberg's), viewing nearly everyone as oppressed and always complaining that the Progressive position is suppressed by mainstream media. But, by now, most readers will get the gist of the new word. Today's Wall street Journal had a story on page B12 about the office of Dell Computer CEO Michael Dell and the President, Kevin Rollins. They share one large office and talk to each other "15-20 times a day." On first thought, that's sweet. On second thought, that is a big competitive advantage. The size of any human hierarchy is based primarily on the number of people who are in the "span of control." Span of control is real. For management, the number is six people who can report directly to one person higher up in the command. Lower down in the hierarchy, span of control can be more than six people reporting to one person, but not many more. That means the second level of management is, at most, six people and the third level is, at most, thirty six managers and so forth. I personally tested span of control when I was a top manager. I took on one additional person reporting to me each month for ten months. By the time I reached six it was still comfortable; then as each new person reporting to me was added, I spent more time at work until, at ten people reporting to me, I was overworked. At twelve people reporting directly to me, I couldn't sleep anymore, my mind was spending all of its time doing its managerial duties. Six people in a span seems right to me. What happens when the two top managers are completely in synch, the way Michael Dell and Kevin Rollins seem to be? Since each one can manage six peopl, that means the second level of management at Dell Computer Corp. can be twelve people and the third level can be 72 instead of 36 for every other corporation. That is a competitive advantage. At five levels, management can ordinarily run a 9,000 person operation. The Dell Corp, twins-at-the-top-shop, can manage18,000 people with the same five levels of management. Fewer levels of management can mean faster and better decisions. In my last blog I talked about "stupid" government because government systems don't have the capacity to learn. One of my great disappointments in this regard is street life. Jane Jacobs in 1961 wrote a masterpiece on street life, Death and Life of Great American Cities. She explained how street life created safety and vitality. Street life requires interaction with commerce at the street level. 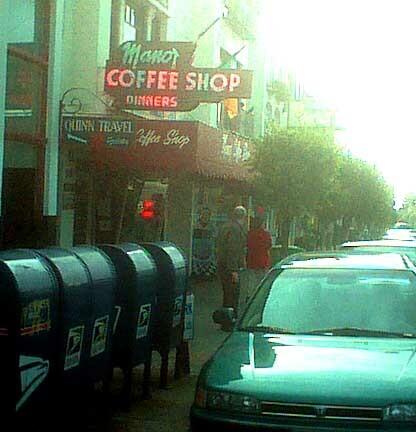 The picture below is 6th and Market, a main intersection in the core of San Francisco. There are five completely blank, half block long walls at this intersection. Until a heavy police presence demanded it stop, drug dealing was a 24 hour a day primary use of this major intersection. Street life stayed away. It still hasn't come back. City planners and urban governments haven't learned the Jane Jacobs lesson in 40 years. What I think would work using Jacobs' ideas would be block by commercial block special tax districts with a high tax rate, like $300 per running foot of sidewalk per year. The tax would be levied based upon the level of pedestrian interest per running foot of property at eye level. A blank wall would pay 100% of $300 per foot annual tax, a boring window with no action 50%, $150, and a street-interacting coffee shop with tables on the sidewalk would be assessed 0% tax. Here is an image showing how the special tax district would work. I've recently been surprised by the large number of apparently competent people, including lawyers, doctors, writers and other professionals, who start conversations in San Francisco with "Isn't George Bush dumb?" and expect everyone they meet to reply, "I can't believe how dumb he is." As Ed Rothstein pointed out a few weeks ago in the NY Times, Raymond Aron, a French thinker writing in the early 1950's, was one of the first point out that Marxism is a secular religion. "Isn't George Bush dumb?" is transparently the mutual greeting of a fraternity of lefty religious cultists. It seems to be form of religious handshake. It is definitely not intended as the beginning of a conversation. Just away to confirm mutual membership. So I googled "religious left" and "liberal fundamentalist". The concepts appear to be coming of age. Religious left has 3,000 internet entries and liberal fundamentalist has 260. Lefty Fundamentalism has a Google count of zero. That is my new term. There is a way to reply to a charge of anti-Semitism. I have dealt with this twice. Once in the early 1980's, when Jesse Jackson tried to redeem himself and once in the late 1980's before a trip to Israel with my wife of the time. I passed on my advice to Jesse, through a mutual friend, that he could meet with any five rabbis and they would all give him the same answer. My wife, of the time, was a fanatic supporter of the poor Palestinian underdogs and was planning to spend her time working with Peace Now in the West Bank ( I knew the leader of Peace Now through an old girl friend). I explained to my wife that I supported her as long as she was willing to make the following statement: "I completely support the right of Israel to exist, in peace, as a Jewish state and to do whatever is necessary for that State to survive." My wife made that statement unequivocally. She wasn't and still isn't an anti-Semite. We had a very productive trip. I was sick for much of the time in Jerusalem while she listened for days to Arab women, by the hundreds, wail (literally) about their homes being bulldozed. The whole trip was rewarding and significant. Jesse never said what he needed to publicly say and never got redeemed. Considering his current state of disgrace I'm glad he never tried to get forgiveness for "Hymietown." Some of my friends think that the statement needed to show that one isn't an anti-Semite is too strong and difficult. The statement does require a morally strong person to make it. Jews have learned bitterly what life is like living in a nation with a mixture of anti-Semites and morally weak people. Think Poland. MLK Jr. wrote a strong statement on why Anti Zionism is anti-Semitism. It is long and well thought out. While we're at it, American Black anti-Semitism is different from European anti-Semitism, Blacks have a heavy dose of envy. European anti-Semitism, including the English variant, is old, and is rooted firmly in Catholic Church teachings. My personal ancestors were driven out of England (to Holland) in the 16th Century. They had already lived in England for many centuries and are mentioned in the 13th Century Magna Carta. Other ancestors were driven out of Spain in the 15th Century. My friend, Per Madsen, commented on the previous blog. He got the impression that I favored citywide election of supervisors over the district supervisors we have now. 1. I have found that district elections provide the best and the worst supervisors. Citywide supervisorial elections provide only mediocre supervisors. The best we have had were Nancy Walker and Harry Britt from the first round of district elections and Aaron Peskin and Bevan Dufty from the current round. All four of these supervisors were genuine human beings, truly exceptional examples in elective politics. Libel laws and reluctance to insult friends keep me from talking about some of the other supervisors. I've been a legislative aide, a campaign manager several times and served on national campaigns early in my working life. The best solution for San Francisco would be three citywide supervisors and six district supervisors. That solution has been rejected by both sides (I've talked to both sides over several decades). Both sides feel that the effort to get voters to chose their ideologically pure plan requires so much effort and expense on their part that they won't water down their pure ideal for a compromise. Neither side sees that a comprise would result in long term stability, rather than regular public outrage that keeps swinging between district and citywide elections. 2. That subject brings up the question of why politics is so "stupid." I use the word stupid in quotes. I have the utmost respect for skilled politicians. They are truly to be respected and admired as individuals for the difficult work they do. I also have great sympathy for the poor individual souls who are willing to stand for election and face the vicious, vituperation spat on them daily by the public. That said, the "stupid" refers to the system of politics which is virtually incapable of learning. We are immersed in good systems and bad. Good systems are: science, technology, law and commerce. These are systems that learn. They are all open, built upon system level debate and the individual systems are designed to incorporate improvements. We don't use lead pipes anymore (science and technology), we make sure police warn arrestees of their right to remain silent (law) and many retail stores are open on Sunday (commerce). Science, technology, law and commerce are learning systems. But politics never seems to learn. Our politics is only slightly better today than 100 years ago, and only in the most rudimentary ways. Today there are fewer political appointees, but bureaucracy is immobile, lobbyists are registered but still disproportionately influential and campaign donations are made public. One good example of a political system not learning is one of the great California disgraces. I was in Sacramento when the change occurred and disaster proceeded. Before 1960 California had the best school system in America, today it is one of the bottom five systems. One change occurred that accounts for this. We went from a cross-filing voting system where anyone could vote in any party primary to the system begun in 1960 where only party members could vote in party primaries. The old cross-filing resulted in moderate civil minded candidates winning elections. Cross filing was an idea from the 1896 Peoples Party later called the Progressive Movement. It was implemented in California in 1911 as part of the Hiram Johnson (Rep.) reform. In 1960 we reverted to closed party primaries and the ascent of two party machines. Party loyalists and fanatics started winning primaries. They dominate the legislatures. That is what we have today. In 1996 a cross-filing initiative was put on the State ballot and against the efforts of both parties and every political institution in existence, it won by two-thirds vote. Then the State court threw it out, deciding that national political parties had a legal right to restrict primaries to their own members. A new initiative could be written to apply cross-filing to all offices except national party delegate selection but it hasn't happened yet. Even after it happens it will take 20 years to replace the current "stupidity." That is what I mean by 'the political system doesn't learn.' Something worked, its absence proves that it worked. We are still stuck with an unworkable, strong party machine political system. 3. Europe really is still "Old Europe" as Rummy pointed out. Per, mentioned at the beginning above, was raised in Europe where his talents and class background railroaded him into schools that turned him into a salaried engineer. That is the Old European way, still is, in every detail. Per came to America, took a course in carpentry, applied his manual and esthetic skills to starting a new business and now has a prosperous online venture making and selling modular entertainment shelving structures. Beautiful pieces. His own business. A free man. America, yes to talent, personal fulfillment and entrepreneurial skill. Europe ... still: anti-semitism (always denied), racism, class divisions, deeply rooted mutual hatreds and 600 year old arrogance. The town of Kingsville, Texas got national publicly in January 1997 when the elected officials voted to change their customary greeting from Hello to the official Heaven-O. The reason is clear, "Heaven" should be promoted over "Hell." Please think about why Kingsville, Texas was a farce. They have no influence on language, their position is wrong in the first place (the origins of hello are not from "Hell") and no one, even in Kingsville, would pay serious attention to them. Now look at my San Francisco Board of Supervisors and School Board. The former wants to make the Patriot Act non-binding on San Francisco and the latter voted unanimously to oppose a U.S. led war in Iraq. All three observations about Kingsville, Texas apply to San Francisco. We have a similar farce. The vote has no positive influence, it just looks like the whole city is filled with lefty kooks. The positions are wrong. The Patriot Act has resulted in 2,500 wire tap court orders last year which was an increase of about 1,500 related to espionage over the 1999 period. That is not enough to keep even 1% of the half a million paranoids in America under surveillance; they all think the government is listening to their phones. 2,500 is less than the number of people injured in the bath tub while talking on the phone. Our elected officials only show they don't understand government. They aren't members of Congress. The S.F. School Board is particularly outrageous in their act. For the past forty years the white students, and all high educational achievers have been leaving the S.F. public schools for private, parochial and suburban schools. The remaining students are at a terrible disadvantage and the public school system is consequently stuck with a high proportion of expensive "special education" students (each requiring $60,000 of support per year). When the S.F. School Board takes a political stand that is far outside the norm of America, is against the position of the overwhelming 95% majority of Congress, they can only drive away more of the middle of the road parents who have doubts about radical liberal education for their children in the first place. San Francisco is a truly diverse city, Our elected officials do not represent the fascinating, exotic and wonderful mixture of people here. By taking gratuitous stands on irrelevant issues they rent the social fabric a little more. Unnecessarily. We don't need these fantasy pieces of legislation. In harsh political light, our elected official also hasten the day when the majority of citizens will rise up and replace the district elected board with a citywide board, as the citizens have done previously. I have thought about the need for a worldwide Beit Din for many decades. A Beit Din is the traditional Jewish legislative body, used more than two thousand years ago and used ever since when the need arises. A worldwide Beit Din would be useful to cope with Jewish issues that are larger than Israel. My concern is that the interests of Israel and Jews outside of Israel will someday diverge. I don't believe they do now, nor have they in the past fifty years. But they may. My concerns were slightly abated this morning when I read that nearly 10% of voters in the Israeli election next week are voting from outside of Israel. This is far from a Worldwide Beit Din ,but it is a rudimentary mechanism that gets the interests of Jewry outside of Israel represented in Israel. A little comforting to me. For more than a year I've been pushing friends and relevant parties for a website that would keep track daily of the construction of the new San Francisco Bay Bridge. The building of a bridge is exciting and would hold the attention of many, particularly young people. Daily "change orders" are fascinating. They relate to architecture and engineering. The greatest lesson to be learned would be how a large, very complex institution works. Very few people ever learn that. I believe that understanding large institutional processes is fundamental to citizenship. After all, how can a citizen even conceive of his/her country without understanding institutional processes on large scale. 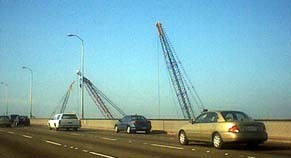 Work on the bridge is already visible. What do you think about having a daily updated website? How can I say such a ridiculous thing as "class warfare is good"? Because there is a worse alternative. The current American budget debate is focused on the great disparity in incomes and wealth that our commercial society has generated and keeps generating year after year. The differences in income and wealth, in our society and worldwide, are very large. There are ten Americans with tens of $ billions and millions of Americans with less than $10,000. Seven orders of magnitude different. It is my opinion that the differences in intelligence and knowledge are much larger than the differences in income and wealth. Ten orders of magnitude (I see you don't bother to defend this numeric proposition). The disparity in intelligence and knowledge is spectacularly large, but fortunately our society pays no attention to it. Virtually none. The only attention our society pays is to keeping public education relatively cheap and accessible. That has little to do with mitigating the orders of magnitude of difference in intelligence and knowledge. Maybe a few hundred people get to develop their intelligence and knowledge that wouldn't otherwise. The significance of the money issue seems to me, personally, of little consequence. There is very little that the Top Ten wealthy can do that I can't do. They can live in complete privacy in 10,000 square feet at 66th and 5th Avenue. Most don't. Bill Gates lives in a giant house in the tules. I could buy a 10 room mansion with indoor pool too, just that it would be an hour from the nearest espresso and NYTimes. On the other hand, I can walk all over New York and Seattle without any problem, complete privacy. 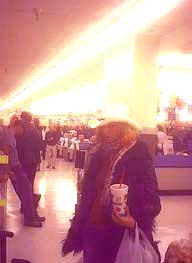 None of the Top Ten can walk around freely in public, they are too well known; and the next Twenty all need bodyguards. The top ten can fly in a private airplane to most parts of the world in six to twelve hours less than it will take me. OK. I'll concede that benefit of wealth and income. Just that one. I know that the people who love me don't care about me for opportunity to get some of my money. On the other, hand intelligence and knowledge are so valuable to me, every minute of the day, that I am a very happy person. I have nearly complete freedom of anonymity. Just talking to other people, reading and walking are endless sources of enjoyment. Yes, my joys can be suppressed, too. Communist societies have and still do try to equalize intelligence and knowledge. They do it by suppressing information and communication, and by establishing required dominant ideologies: think Russian biology and Russian-German hatred of "Jew Science." Think: Cultural Revolution. I'm glad we have our political class warfare about income and wealth inequalities. My personal zone of inequity is ignored. 01/18/03 Testimony at the CPUC. Executives Beware. It looks like a success. I've been an expert witness testifying on behalf of minority and poor people for more than twenty years. I am qualified as an expert in many areas of business and have testified in dozens of legal and regulatory cases against big companies. There really aren't any other business experts who testify for minority and poor plaintiffs for the simple reason that they would never have any regular business clients again. It's true, sorry. I've seen experts for minority people lose all their consulting business after testifying on behalf of minority people. The experts were good hearted fools. I, on the other hand have many sources of income including small companies and clients outside the U.S. I am not being a good hearted fool. My testimony was about executive compensation for regulated California utilities. I was specifically testifying in a case where Southern California Edison was asking for a rate increase. Utilities are a major cost in the household budget of poor people and it is worthwhile trying to protect poor people on this matter. My concerns are the unfair hidden costs that are used to justify increases in utility rates. I argued that the whole issue of corporations providing reliable information about executive compensation (CEO and top executive salaries and bonuses) to the public, to shareholders and to their own board of directors was no longer to be trusted. A major cornerstone of American business integrity had been removed in the last half year. I cited the cases of Jack Welch (former CEO of General Electric) whose wife disclosed in a divorce case that Jack had a pension guaranteed to earn 12% interest. Twelve percent is a high rate of return, costing GE plenty of money. This company expense was not disclosed to anyone, including the Securities and Exchange Commission (the SEC didn't legally require it to be reported). I also cited the case of the Secretary of the Treasury in waiting, John Snow, who was CEO of CSX (a railroad company) and got $70 million in undisclosed termination compensation which was built into his CEO contract. Two damning prominent examples of corporate calumny. No corporation can be trusted because these examples were from previously respectable corporations. My testimony was well received by the audience, the administrative law judge listening to the case and to the rate payer advocates who work for the regulatory agency. I suggested that new methods of collecting information about executive compensation be implemented and that this public agency take the lead. We'll see. It looks good right now. 01/18/03 Can I Improve Greens-to-Go? I wanted to try and speed up the take out section which squeezes into about 50 square feet at the front of the restaurant. On busy days a line of 50 people can stretch out the front door for a half a block. Two hundred people an hour are sold freshly made sandwiches, salads, soups and pastries. 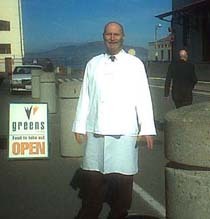 First I worked in the prep-room. No improvement needed there. Then I spent time watching the line and being in the line. Finally I worked at the cash register handling credit card purchases which are slow. I speed up the line about five people per hour. I arrived as a consultant at Greens with a dozen brilliant ideas. I knew improvements should be easy. My conclusion after careful examination and working there: Green's management has optimized the space. It can't be improved. There are two reasons it works so well, aside from the excellence of the managers. The first is the rule of commerce. If you respond to your customers, in time you will generate more sales. The customers demanded credit cards for years. Finally, cards were accepted, excluding Amex; the cards more than paid for themselves and the subsequent slowing down of the line. Volume went up. People wanted espresso drinks, asking for them thousands of times. They finally got espresso drinks without slowing down the line. (Wait a second ... you saw that the long line resulted in more people buying more food as they looked at what other people had and looked at the displays ... on short line days slowing down the line probably increases sales). Second, veggie take out is a new commercial field. Because veggie take out is relatively new people have felt free, for decades, to ask for specific additions. This has made the veggie audience, which is the richest most educated, young and vigorous part of our society (I'm not a veggie, I just prefer veggies), the fussiest group of human eaters anyone can imagine. The consequence is that you can't streamline what they order. But you get in return people who pay more for food and are infinitely loyal. The competing sandwich shop 50 feet from Green's take-out, with turkey on rye and tuna salad on 7 grain toast seldom had a line of more than four people, while I was there. Summary: I couldn't find any way to speed up the line, make the service more profitable or serve the demanding veggie customers any better. 01/14/03 What the Japanese Read. I write a monthly column for the Japanese Foreign Affairs magazine that goes to their foreign affairs and corporate communities. If you want to read some of the articles listed here, go to the site. Some of my friends consider me a traitor because the articles are designed to help Japanese be more effective in their dealings with Americans. I personally do it because I think it reduces inter-cultural friction, which I consider a moral "good" in itself. Who do you want advising foreigners? Textbook writers? Stolid academics? Hollywood Columnists? Pat (Father Coughlin) Buchanan? I don't have an answer. 01/13/03 Not All Peaceniks Here. The San Francisco Bay Area is the anti-American peacenik hotspot -- from the Pacific Ocean on the West to the Berkeley hills on the East, from the San Francisco city limits on the South to the Russian River on the North. But there is one anomaly that few people know about. It's The Castro. I live in the Castro district. Last October I noticed a strange phenomenon. Posters for the October Peace March came down within hours of being put up all over my part of the city, at least the part I drive and walk in ... north of 17th Street and west of Portrero Hill. About half the entire city. Then my Supervisorial District elected an openly pro-Israel, anti-homeless candidate over a flaming pro-homeless, pro-Palestinian candidate. On Tuesday last week I was walking through the Castro district toward downtown on Market Street and I saw more than 15 large 10" by 14" Peace Rally posters pasted to every flat public surface. By the time I walked past the 15th poster I was curious and checked to see how hard it would be to remove. Easy. The paste was still wet at 6:20 AM on that dark January morning. There were dozens of small 4x4 self sticking notices, too. By the time I went by the same location again ... hours later ... every single large pasted notice had been pulled off and most of the 4x4's had been removed with razor blades. What is going on? My neighborhood was quickly and aggressively removing peace posters. The answer can be found in the vote for the gay district supervisor (see 12/18 blog) and the fact that (1) all the local gay newspapers run regular columns about the death penalty being applied to gays in the Arab world and (2) the existence of an organized group of mostly gay Jews who keep this issue of Arab-anti-gay morals on the front burner. That seems to be the reason and the evidence. The quiet, peace loving gay community isn't a big supporter of the Peace Movement. 01/11/03 New York Times health report is a sad journalistic example. The NYTimes had an article in the Thursday Science section summarizing an article on Obesity in Adulthood and Life Expectancy. (Good, today's blog is related to news). If you are a female age 40, are 5 foot 8 inches tall and weigh 185 pounds your average lifespan is 40 more years. If you weigh 165 pounds you will live 46 more years. For a male the heavier dude has a lifespan of 38 years more years ( to age 78) the trimmer guy has 43 more years and will out live the chubby woman of the same age and height. There is a problem. First, this is a very important finding because of its source. Second, the public has no idea what is reliable in health news and what is garbage. Thus everything is ignored. Which is reasonable. What to look for in health studies. There are only a few good studies. Start with the Gold Standard. (1) Danish studies are the most trustworthy. The Danes have a comprehensive national health plan. That means that health care treatment, over decades, remains fairly consistent across time, across income and across urban/rural differences. Certainly more consistent than in the U.S. where there is no similarity between the treatment of a blue collar Mexican worker in Tuscan Arizona and a matron in Georgetown D.C.. Also, when Danes take a course of drugs or report on data it is much more reliable than most anywhere else. (2) Almost any health issue deals with outcomes. Does fluoride during childhood have dental benefits in 40 years, does it increase liver cancer in later life? Those are outcomes ... over time. That is almost always what you want to know, even with drugs, since side effects can take decades to show up. The only way to get reliable data for outcomes is to follow the same group of people for many years and do careful medical check-ups and histories on each person. Such studies are called longitudinal. There are three such studies in the U.S.: The Framingham Heart Study, over 5000 people since 1948, with 5,000 more added in 1971. The Harvard Nurses Study, 120,000 female nurses since 1976 who get regular check-ups and fill out questionnaires. The Survey Research Center Oakland Health Study. 5,000 participants in 1966 and 1971 with very precise data. All studies were based on adults and Framingham and Harvard Nurses were mostly over 30 years old. (3) Identical twin studies where you are looking at different treatments. For example one twin smoked and the other didn't. There is one good longitudinal twin study in Denmark. When you see a report from that data base, read it. Twins have the same genes and similar environments, so any results that show big differences are a fair measure of the real effect of the treatment. Almost all other medical studies can be thrown away. Occasionally something interesting comes along from a double blind or latin square study, like the time researchers ground up all the aspirin in the study, administered it, and found no difference in stomach aches. The hardness of the aspirin pill had been the cause of stomach aches; it was not helped by the buffering in Bufferin. That kind of study is rare. I've seen so many crappy studies, usually costing $ millions, including meta-studies ... the public should reject them all. Nearly 95% are seriously flawed and the other 5% require people like me s to study and evaluate their results. What is stunning about the study reported in the NYTimes? I read the full study in the Annals of Internal Medicine. The study is based on the data in the Framingham Heart data. So we know the data is good, the timespan is reasonable and the sample size is large. In fact this study is the best and only reliable source for a reality check on the consequences of male, female body mass over a lifetime. No other study on the planet can come close to telling us the consequences of being overweight. The researchers, six names on the paper, also checked alternate explanations for the drastic shortening of life spans due to overweight. They looked at the weight of subjects at older ages, no influence; they considered smoking which had the same life shortening consequences as weight; they looked at diabetes, stress, education and exercise, none of which had significant effects. Checking alternate factors is very important. The basic conclusion stands up. The study is real and it is important. If you are between 30 and 50 you had better care about your weight, it is the most significant health characteristic we have ever known about. Of course the study was reported in a column three inches high on the bottom of the last page in the Science section of the NYTimes because journalist know nothing about research quality. It needn't be that way. When I was in the field of public opinion research (way back in Gothic times -- the 1960's) I was offended by journalists who treated a high quality scientific public opinion poll as the exact equal of a barbershop straw poll. So as president of the San Francisco chapter of the Pacific Association of Public Opinion Researchers, I took a resolution to the annual statewide meeting to require our members to publish sample size, sampling procedure and make questionnaires public. I then planned to teach classes for journalists. My resolution ended up requiring the National Association's approval which took two more years because George Gallup had some petty reservations. After my resolution became a national membership rule, I then proceeded to teach classes to journalists. Before long, sample size and reliability began turning up in news stories and straw polls were forgotten. The same could be done today with health studies. It just takes some morally courageous, respectable person, in the field of health care research to stand up and organize. Of course, I've been out of the active field of public opinion survey research for twenty years. The issue of survey response rate is now so serious that the press and the professionals must learn to address it. In 1960 over 75% of people could be reached at home for a personal face to face interview. Today, less than 5% of a universe of people can be reached by random phone dialing for a live interview. The difference between that 5% and the 95% who aren't contacted is important and should be openly discussed in every public survey. In Talk of the Town in the January 13th edition of the New Yorker is a piece called Tastemakers by James Surowiecki. His thesis is: "... there are two ways to build a successful business. You can give people what they want, but give it to them more efficiently, as Wal-Mart and Dell have done. Or you can persuade them to want something that they didn't previously want, as Starbucks has done." Surowiecki hasn't worked on the ground like I have or he'd know that he is just mouthing leftist nonsense and platitudes. He says that the WalMart model is a zero sum game that puts local stores out of business. The WalMart model is not a zero sum game. Sam Walton opened vast new markets and no local stores would have closed if they had adapted to the changes. WalMart, with good parking, is cheap and vast compared to local stores. All the early locations were in rural areas which had never had decent retail outlets. WalMart tapped into the $30 billion in annual farm subsidies. Farmers had money and no decent nearby stores to spend it in. The same was true for the Mall of America in Minnesota that sucked out the same billion from t he entire mid-west. Business historians will recognize the same pattern with Sears& Roebuck a century earlier. Local stores need not have a problem. Local can be fresh, specific to the market, alert to changing needs and highly service-oriented. Then locals can survive. Most locals aren't able to provide any of these qualities. They prefer to die rather than be born again. I gave speeches to the book store owners in the San Francisco Bay Area on how to respond to the terrors of Borders and Barnes & Noble. All the stores that followed my advice survived. Some even thrived ... the most specialized ones. The language Surowiecki uses sounds sinister and manipulative to me: " ...you can persuade them to want something that they didn't previously want." Surowiecki's nonsense is evident in one of his own sentences: "All these companies relied on clever marketing (though in different ways. Starbucks, for example, has spent very little on advertising its stores and cups serve as ads)." Starbucks did virtually no advertising so it is absurd to talk about "persuasion" or "clever marketing." Starbucks simply opened its stores in perfect, high-traffic locations, after the store designs had been fine-tuned by experience in Seattle and the coffee and related product flavors were perfected in Peets coffee store in Berkeley. Starbucks followed the trends and moved into markets exactly as those markets developed gravitational centers of high tech white collar workers. It took one year to move from Seattle into Santa Monica and it took nearly five years to move into New York. Alex Gault wrote me in regard to the Feds cutting Colorado River water to California by one third on January 1st: " Is this decision a punishment to Californians for not voting Republican, or is it an expression of enlightened environmental policy?" I know this issue. I had the California State Fair in Imperial County as a client a few years ago. What I saw was beyond belief. The desert was being irrigated with nearly free Colorado River water to grow alfalfa to ship to Japan to feed Japanese cows. The whole valley. Millions of tons. No kidding. The cows couldn't come to Imperial County to eat because it is 115 degrees F in the summer. San Diego tried to buy the water. No offer to pay the Imperial farmers for the water seemed to satisfy the already-rich farmers. Each farmer could gain hundreds of thousands of dollars per year, but they couldn't agree. So, now they will have to agree to become rich instead of fabulously rich. Yes, everyone, except the Imperial County farmers should be delighted with the Fed's decision. I'm not sentimental and I'm definitely anti-Romantic. But because of my love of commerce I'm interested in businesses that survive. One of my favorites is an authentic diner in San Francisco. Its survival might not be a surprise in St. Louis or Waltham where "old" is publicly sentimentalized, but it is a surprise that an authentic diner is still here in San Francisco. Salads still have jello and iceberg lettuce. Apple pie, meat loaf with gravy, BLT sandwiches on white toast and weak coffee are standards. Here are two photos. The second tells the story. The neighborhood is the oldest Roman Catholic Irish and Italian population in San Francisco. That creates the persisting demand for this diner. 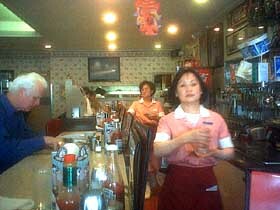 The staff is Chinese-American and that keeps the facilities and menu the way it was seventy-five years ago. Chinese business people are stunningly conservative. There is still a Chinese restaurant where the first one was opened in 1825 on what is now Kearny St. The building the restaurant was in and every building for six blocks West is still owned by Chinese-Americans. Three guests on NPR's Science Friday got me upset. They were terribly wrong. The three were science editors from the L. A. Times, Discovery Magazine and Business Week. K.C. Cole, Stephen Petranek, and Paul Raeburn. The three writers said that we learned last year that the population explosion was over, the end was brought about by contraception and that world population could reach 9 billion. What is wrong with that statement? Everything. First, I had a party at my house in 1994 to celebrate the end of the population explosion. The 40 guests came, after seeing the data I mailed with the party invitations to hundreds of my friends, we discussed my tables extensively. Nearly all of the people to whom I wrote, replied or commented in person over the following few months. Many of my friends are journalists and others are prominent in the environmental movement. Not only is this news not recent, it wasn't recent when I discovered it. I was looking at global population data for 1990. The data showed that the explosion had ended in the mid 1980's. The data was clear with 130 countries reporting detailed population data. All the developed nations had fallen below the reproductive rate of 2.0 decades earlier than 1980, and the big nations, India and China were approaching 2.0 by 1990. Now, in 2003, Japan actually has a declining population. Most of Europe would have declining populations except for recent East European and Arab immigration. So the end of the explosion was not recent. It was clearly evident in 1990. Second, contraception had nothing to do with the end of the population explosion. That is nonsense. When you look at the data from 130 nations it is ridiculous. Many have had good contraception for 150 years (maybe even several thousand years), and many still have virtually no contraception (Africa and Latin America). The end of the population explosion is only understood by rejecting Malthus and looking at the data. What did happen to end the population explosion? Beginning in urban Massachusetts in 1840, for reasons we still don't understand, infant mortality began to decline, female death in child birth began to decline and life time survival of males over 21 began to grow from 65 years old to the current 77 years old. The reduction in infant mortality, decline in deaths from child birth and extension of male life spans spread from Massachusetts to the entire world. The rate of dissemination determined the increase in life span everywhere and the increase in life span was the only reason for the population explosion. When infant mortality could not be significantly reduced, when very few women died in childbirth and male life span passed 75 nearly everywhere, there was no more force driving the population explosion. Sorry guys and K.C. Cole. That is what it is. You can argue forever about sanitation and medical technology as the cause, but we don't know what really happened. The data doesn't clearly support any hypothesis. If you doubt me, learn statistics and look at the data. It sure as hell had nothing to do with contraception. As for the last fact, 9 billion max. population. 9 billion was the highest global population could go when I calculated it in 1994. Now with the 2000 global population data becoming available it is evident that we'll never reach 9 billion. 8.5 billion is closer to the maximum and that is a wildly high projection. There have been some recent blog discussions on the roots of anti-Americanism, domestic and foreign. The best summary article I've seen was a symposium in the November issue of FrontPage.com by Jamie Glazov with Paul Hollander, Stanley Kurtz, Dan Flynn, and Victor Davis Hanson. The discussion failed to note that anti-Americanism is stuck in one domain. The intellectual domain. I don't find anti-Americanism in other domains such as music, art, film, products, services, investments or the American language. I only find anti-Americanism in the intellectual domain and associated abstract worlds such as "global imperialism", "cultural hegemony" and "foreign policy military exploitation". Burning a MacDonalds is burning an intellectual icon, it is action in an abstract world, the intellectual domain. Burning a MacDonalds is not rejecting an inexpensive "clean" hamburger. There is good reason that the intellectual domain is permeated with so much anti-American while the fields of music, art, film, products, services, investment and language are not. American vitality and originality is evident in those seven fields. People can consciously reject modernity and commerce, but few reject vitality and originality. The intellectual world, on the other hand, is relatively quiescent. The intellectual world is mute in the realm in which America is a Goliath; the intellectual basis of commerce. We have many good thinkers about commerce, such as David Landes, James Beniger, Joseph Corn and Alfred Chandler Jr. I appreciate them all. None of these thinkers bring to their works the American commercial vitality that could have been understood by Max Weber or Joseph Schumpeter. We just haven't had the great thinkers of commerce stimulated by our visible genius. Not yet. Moreover, the raging Socialist/Marxist wave that swept over intellectual America in the early to mid-twentieth century swallowed whole most public intellectuals. As a consequence, their allegiance to Socialism meant their credibility evaporated because they were allied with the disastrous realities of Stalin, Castro and Mao. Our intellectual domain became populated with ghosts. The cold war is over; American commercial vigor is once more important. I expect public intellectuals to emerge. I see them already in the blogosphere. These vital intellectual minds are what will supplant the ghosts of Socialist/Marxist thought that haunt the world. For readers who don't know what it is, simple living is: leading one's life with the fewest possessions. I have a testable theory about simple living. To start with, simple living looks ridiculous to most people who aren't simple livers. I'm a simple liver. My question is: can we recognize fellow simple livers? "When you think about the lives of well-to-do people you know or have encountered would you consider their lives: (a) happier, (b) about the same, (c) less happy ... than the lives of most other people you know?" In my small sample, simple livers always answer (c) and the rest of the of the people I interview never answer (c). Why? Is this a reliable predictor of simple livers? Several friends, with a specific request from Professor Srikumar S. Rao, have asked for more material on Simple Living. I wrote a book (really a pamphlet) called Simple Living Investments for Old Age in 1984. It has never stopped selling. Every year I get large orders from Alternatives for Simple Living, a religious group in the Midwest and from Loompanics a survivalist bookseller in the Northwest. I just put my articles on Simple Living on one list and I added a long literary masterpiece by Catherine Campbell. I also added Catherine's article on the left in hopes that she will soon start doing a blog. I declare that it is now official in The United States: Thanksgiving is the family holiday and Christmas is the children's holiday. The NYTimes noted a few weeks ago that fewer people were going home for the Christmas holiday. I noticed it on a large scale and then phoned my friends in different cities to confirm the observation. I specifically phoned therapists, medical processionals, lawyers and others who have significant contact with a variety of real people on a daily basis. Its official now. You do have to go home for Thanksgiving which has historically been a comfortable family occasion. You don't have to go home for Christmas nor send presents to adults. You do have to exchange presents and go home if you are a child, parent or live-nearby grandparent. There has to be some point at which we urban dwellers draw the line against more large cars. I draw the line at military vehicles. Hummers, tanks, missile launchers and Armored Personnel Carriers. Hummers are the specific and immediate problem. I believe it is a direct threat to civil society to have military vehicles patrolling our urban streets. There is no viable civilian use for a Hummer. What can we do to stop this military incursion? My personal response has been to push the horn for a count of 30 whenever I see one. Many of my friends agree with this and point out that a dozen people behaving like me would stop this invasion in San Francisco. Many other friends feel they can't honk on Hummers. The honking, they argue, could generate adverse responses from Hummer drivers who might become more malicious and could also generate adverse collateral responses by civilians who will be offended. These friends suggest pushing for City and State legislation to ban Hummers in public parking lots, airport parking and metered parking spaces. 01/24/03 D Sec. Rumsfeld was encouraged by his European counterparts to talk about 'Old Europe.' His peers are embarrassed by their own stogy citizens and want to create a debate about the new global realities. 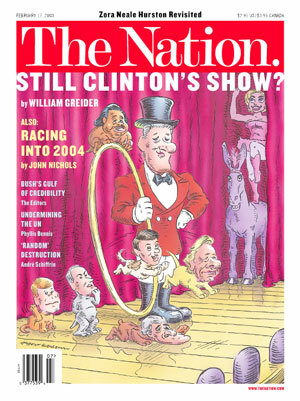 01/11/03 C- Republican convention in New York in 2004. One strong argument was that Bush is the greatest friend of the Jews in 2000 years. Jews will increasingly recognize this, especially in NY by 2004. 01/08/03 D The White House doesn't take the budget proposals too seriously. We are in a business cycle and are already beginning the upswing. Budget stimulus would be harmful. Just a chance to raise some good issues. 12/26/02 C- The U.S. Ambassador in China has been telling China that North Korean nukes are China's problem. South Korea's second largest exports are to China. !2/25/02 D A secret American unit is coordinating Afgan operations in Kabul with Beijing. Close military ties are in place. 12/17/02 D+ Missile Defense. Source: Foreign Office conversation in Japan last summer. The first deployment of the U.S. Missile Defense will be in the Sea of Japan against North Korea for the Japanese. The Japanese will pay about half the development costs equal to $15 billion. These are launch phase missiles only good against N. Korea. They can travel no more than 200 miles in a few minutes to hit a missile leaving a launch pad at very low liftoff speeds. 12/15/02 B The administra-tion forced the CDC to accept the military small pox plan. It starts with with voluntary innoculation of core providers who are the ones who innoculate the first responders. Only a majority of the core is needed to have enough people to survive an attack. We would then have three days to innoculate. By then everyone would be ready to shut down the society for a true, but expensive, quarantine. 12/12/02 A- The Wall Street Journal reported that Iraq launched more Scuds at Saudi Arabia in the '91 Gulf War than were launched at Israel.